In cities across America, graffiti taggers are costing municipalities and businesses thousands of dollars in cleanup costs and potential lost business. Reports also suggest that graffiti is not an isolated problem but is often related to vandalism, theft, or other public disorders, which all add to these concerns. Prevention of these incidents is an on-going pursuit but one business in Seattle, Washington has found a solution with megapixel video surveillance cameras from Arecont Vision®. Located in the Capitol Hill neighborhood of Seattle, the historic two-story brick and timber commercial building at 115 Belmont Street is home to a Goodwill® Industries store. The store is surrounded by apartment complexes, coffee shops, and other commercial establishments. Renovated and upgraded in 2002 to make it more attractive to potential tenants, the building was a prime target for graffiti vandals and few perpetrators were being apprehended. Retail sales were negatively impacted and the property’s value was jeopardized. Local contractor Sequoyah Electric and Network Services provided the property owner with a solution to help resolve the recurring graffiti problem. By installing Arecont Vision® megapixel cameras, it was expected that the surveillance system would capture high resolution images of the taggers both during the day and at night, and provide the police with the evidence they needed to apprehend and prosecute the offenders. Five Arecont Vision® MegaDome® 2 vandal resistant 3MP cameras were installed with an exacqVision video management system. A tagger was caught on video defacing the building almost immediately. The quality of the video allowed an identification to be made and the matter was handed over to the Seattle Police Department. After a few more taggers were caught on video, word quickly spread and the graffiti problem disappeared. Incidents of vandalism and theft were also captured by the Arecont Vision® megapixel cameras, and the detailed images provided the authorities with sufficient identification and forensic documentation for prosecution. 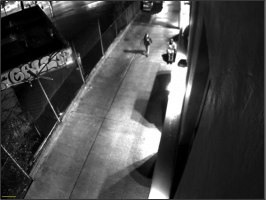 “The excellent resolution and frame rate of the Arecont Vision® cameras makes forensic review of the video evidence a snap. We are able to resolve facial detail and provide the authorities with quality images to assist with identification of suspects,” said Jon Tabler, loss prevention systems manager, Seattle Goodwill® Industries. The megapixel surveillance system was designed so that both the building owner and the local contractor, Sequoyah, can remotely access live or recorded video with the ability to zoom in on footage for a closer look. A mobile app gives real time access as needed. The cameras are contained in environmental, vandal-proof housings and automatically switch from color to black and white recording in the evening for round the clock surveillance. Theft and vandalism may never be completely eliminated but with the Arecont Vision® megapixel cameras deployed with exacqVision video surveillance software, the building owner and the authorities now have the tools to initiate prosecution while protecting people, property, and assets.